Henry Jeremiah Gardner arrived at 36 weeks and 3 days weighing 6 pounds 10 ounces at 5:25pm ET on Thursday, December 20, 2018. I haven’t thanked God for Henry being born alive. Because then I would have to thank God for Tinsley being born dead. Which to me would mean that both were intentional and part of some Grand Plan…but my God doesn’t have a plan, at least not one that involved my daughter dying. I do think, however, that God finds ways to make His presence and existence known to us, to reveal that there is more to life than our earthly experience, and to offer us strength and grace in the face of tragedy. So I wanted to share where I found God the day Henry was born. The OB nurse: When I approached the nurse’s station that I had walked towards to ultimately receive the news that Tinsley was dead, I started hyperventilating. Then I saw Jess – the nurse that was with me that long night of trying to convince my body to let go of Tinsley. “Do you remember me?” she asked smiling. “I’m going to be with you today when you deliver this baby, too.” It was so amazing to have her there. Why? She knew everything already – I didn’t have to explain the context of this “rainbow baby,” and why I was such a wreck on a seemingly happy occasion. She also wouldn’t be surprised if started having a panic attack from fear and flashbacks during Henry’s labor and delivery (which I did). I could talk about Tinsley! Jess wanted to hear how we had integrated her into our lives and the ways we were honoring her. Talking about Tinsley helped calm me while laboring with Henry. She gave Tinsley’s life meaning. Jess said she had never been with a mother through the whole stillbirth process. She told me her experience watching me grieve and love Tinsley was life-changing for her. And although already a nurse on the maternity floor, she has now gone back to school to become a midwife – after that night she felt she had been called to serve mothers and their babies in an even greater capacity. A supporting nurse: Nancy came in just in time to see Henry being born. She was also present at Tinsley’s delivery, and had helped wheel me out of the hospital. She told me then she would see me again under happier circumstances. She was right. The anesthesiologist: The doctor who administered my epidural with Tinsley was also on call when I needed my epidural for Henry. He remembered me immediately and because Tinsley’s epidural was problematic, he did something different this time, making the epidural more effective – which reduced the overall stress of the labor and delivery experience dramatically. Our minister: Rev Matt called my husband Charlie around noon just to see how I was doing because I had been on his mind. He had no idea my water had broken at 11am. On call OB: At 34 weeks I went up to L&D, convinced Henry was dead. Obviously, he wasn’t, but that’s when I met Dr. Kaz who was on the floor for Henry’s delivery instead of my regular OB, who was on vacation. So thankfully I had a doctor with me that knew my history. Pediatric nurse: Henry had neonatal jaundice, which required an overnight stay for phototherapy on the pediatric floor of a neighboring hospital the night after we had been discharged. Jaundice is particularly common for premature newborns and the treatment is non-invasive and effective. But after all the work and stress it took to bring him to the world, the last thing I wanted to do was go back to a hospital and watch his little 6 pound body quivering naked under strange lamps and not be able to hold him. It was also triggering and traumatic to have nurses poking and prodding him, checking vitals and taking blood from his sweet little heel. We were admitted at 2pm on Dec 23rd and all I wanted was to be home for Christmas Eve… and ultimately we did get back home around 8pm on Dec 24th. But around 5pm on the 24th I was losing my patience and feeling really overwhelmed, which is when a new nurse came in the room. When she found out that my 3rd daughter had been stillborn she shared that decades ago she had 2 stillborns at 7 months. 2 stillborns. It was very clear that she had not talked about her experience as a loss mom very much, if at all. Doctors encouraged her not to hold her stillborn children, her husband asked her to stop talking about them, friends were confused when she got depressed after their deaths. For the next few hours I listened to her and we wept for our babies together. I was so pissed off to be at that hospital but I was able to be there for another loss mom so we could miss our babies and speak their names together. God was most certainly in that room with us. God also showed up in the amazing group of people that surrounded me, that carried me, though this last year. And by me, I mean me and my entire family. My medical team: my OB and his staff, the MFMs, the PA, the pharmacist, the at-home nurse, my therapist … there were a lot of healthcare professionals taking care of Henry and me. And none of them were assholes. That actually is amazing. My loss mom friends, my PALs friends: I could not have survived without them. Some I knew from losing Tinsley, some I met during the journey. They were my guideposts. They still are because guess what… having a living child after having a stillborn is a mindfuck of its own. My regular friends: Even though they didn’t know what I was going through, they knew it was hell, and they gave me permission to just be in that hell. They didn’t try and fix it or understand it… they were just present. One in particular must have set a reminder on her calendar to check in with me every few days because she has not left my side since Tinsley died. And then she literally was by my side soon after Henry was born. She has shown me what true friendship and love look like. Thank you Megan. You will never know the impact your support has had on me. Coincidentally….her first child and Henry now share a birthday. The moms of my sons’ friends and our daycare. There was constant sensitivity and support for us as the months passed and I grew bigger and bigger. The daycare even had a tree planted near its playground for Tinsley. They have always included her as part of our family and the teachers gently helped James process his feelings around both Tinsley and Henry. My colleagues, HR director, and boss: My workplace went above and beyond in supporting me, particularly by protecting me from talk about other pregnancies and babies… a couple of them sacrificed sharing the joy of their newborns with other colleagues on my account, and I will be forever grateful to them for this kindness. Our community. The town’s First Selectman had Oct 15th declared “Pregnancy and Infant Loss Awareness Day” in Newtown at our request. The local newspaper shared our story of loss. and of hope in our rainbow pregnancy. Our church: the ministers and the congregation acknowledged my pain, my fear, my anger, and my cautious hope on a weekly basis. My neighbors: one listened to me spew my worries countless time at the bus stop (and had a ziti casserole in our fridge the first night we were back home after he was born). The clerk at the grocery store. One of the checkout women at the Big Y (where I go multiple times a week) was devastated for me when I lost Tinsley. She cried when I came into the store without a bump and without a baby… and as soon as I started showing with Henry, she made it a special point to ask how I was doing, and tell me she was keeping my family close to her heart. 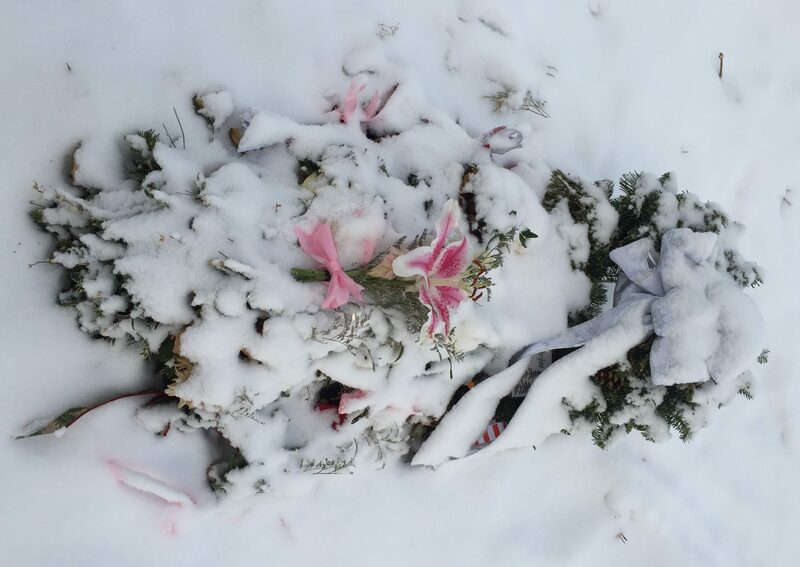 She understood my pain and my longing in a special way – she saw how many flowers I bought in 2018, and knew they were all going to my daughter’s grave. When I brought Henry to the store she literally rejoiced and called the manager to come meet Big Y’s newest shopper. This past year I had many moments, days, weeks, and even months where I just couldn’t find God. But I could always see Him through the genuine love and support of the people around us. And on the day Henry was born, God made sure He was in the room with all of us…me, Henry, and Tinsley…ever reminding me that He indeed moves in mysterious ways.